See beautiful soft stripes emerge from the one yarn. 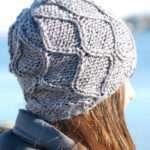 Stitch pattern creates lots of texture. Loom: 28” Knitting Board + peg extenders for double knit set at 2cm spacing. Yarn: Lion Brand Scarfie, 4 skeins. Cream/Taupe. 312 yds. per skein. Bulky weight. Hand wash and dry flat. Cast on 64 stitches in Stockinette. Lay anchor yarn of any color, as it will be removed. Change to Rib stitch. Work (6) rows in Rib stitch. The Honeycomb Pattern is formed when you use 2 different weave patterns, each for 2 rows, and then keep alternating for the length of the throw. Row 1: Wrap pegs 1 top -4 bottom, and up to 2top-6 bottom and continue wrapping every other peg at this angle. When you get to the end of the stitches, return by wrapping all pegs skipped. This will result in consistent wraps at end of loom. Hook over. Row 3: Wrap pegs 1 top-3 bottom, to 2 top-5 bottom, then, 4 top-7 bottom, and continue for every other peg. Hook over. Repeat the Honey Comb Sequence until the throw measures approximately 42” or until you have completed a desired, and matching sequence in the variegated yarn. Work 6 more rows of Rib stitch. Work one row in Stockinette stitch. Bind off loosely. Bind off at anchor yarn loosely. Gently pull out the anchor yarn. Weave in yarn tails. Beautiful! Two questions, what is the spacing between rows and is there a graphic of the peg wrap? Hi Melissa, the boards are at mid spacing or 2cm apart. 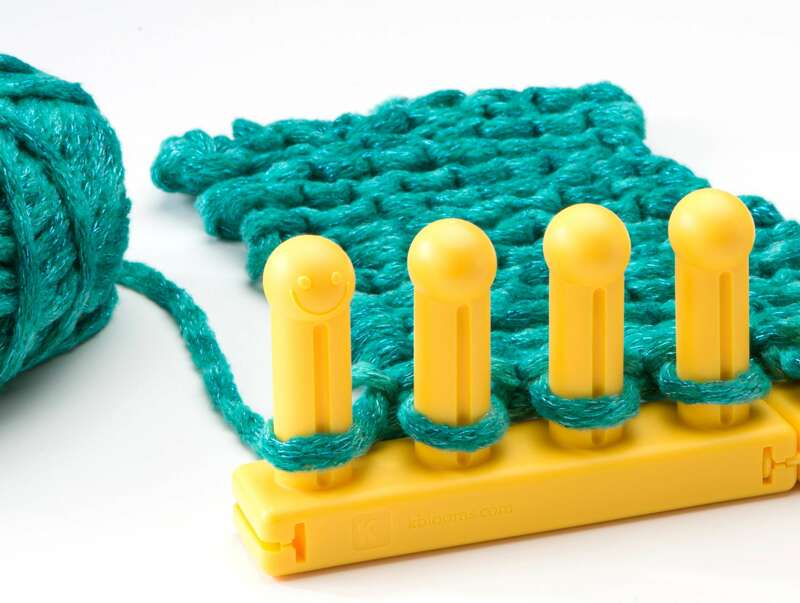 You can look at the pictorial instructions on knitting board website. If you go to the Criss cross stitch under Double Knit, the weaving is the same, but this design works 2 rows of each stitch pattern. So the whole Honeycomb pattern is a total of 4 rows. I love these! So beautiful. I a newbie, but learning fast. Do you have a pattern for the hat? 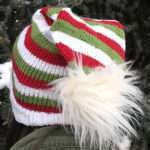 The hat pattern was written by designer and will be posted soon.